• Flash-ROM reduced from 64M Bytes to 32M Bytes. • Battery with lower capacity. • No Press-to-Test LED indicator. • No network adapter port. • No docking connector for Navigator Wireless Cradles, Lab Stations and Docking stations. Dismantling this TI-Nspire CM-C manufactured in September 2011 by Inventec Corporation in its Pudong Campus in Shanghai, China reveals a design similiar to the original TI-Nspire CX centered around a tiny System-on-Chip. Don't miss the early prototype of the TI-Nspire CM-C labelled TI-Nspire CM (Chinese Language). 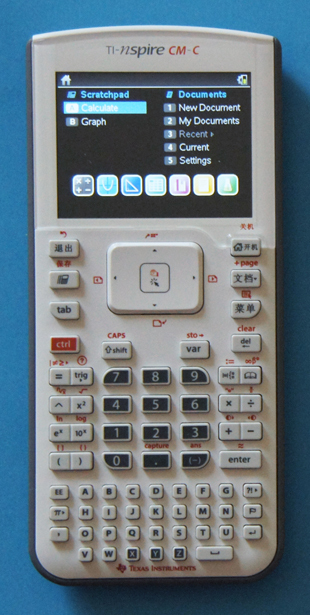 Since the TI-Nspire CM-C lacks a QWERTY keyboard it is permitted (as of May 30, 2013) for use on SAT, ACT, PSAT and AP exams. © Joerg Woerner, May 30, 2013. No reprints without written permission.